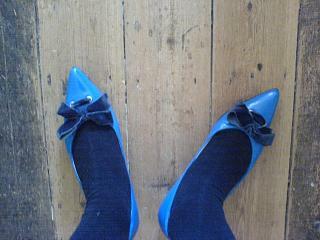 Today I’m wearing a pair of bright blue patent flats with a velvet bow that I was given at the Kurt Geiger press day. I don’t really wear flats any more but I like the colour. I have small feet so I tend to like coloured shoes. These shoes remind me of when I bought my first pair of shoes. Does every girl remember where she bought her first pair of shoes? I bought a cute little pair of beige flats with a little bow on them. The weren’t really beige, they were maybe more of a cream colour with a sheen to them. I remember them quite fondly. I think I took a friend with me to confirm the purchase.